Yarrow, also known as Achillea millefolium, is a great herb to have in your arsenal for any unexpected wounds. If you have this herb in your yard, keep it in mind to use should you or your pet get a cut. When used externally, it has the power to stop a bleeding wound quickly. In an emergency you simply chew the picked herb and apply it to the wound in the form of a “spit” poultice to stop the bleeding. The aerial parts of yarrow are the best parts of the plant to use. They should be harvested while the plant is in bloom from June through September. In addition to its ability to effectively stop bleeding, yarrow can be used for the circulatory, respiratory, skin, urinary, and digestive systems. Yarrow was also used in ancient societies for menstrual problems, indigestion, hemorrhoids, and snake bites. 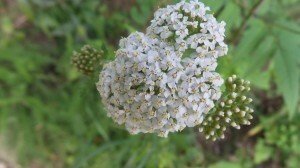 Yarrow acts as a blood cleanser and is good for colds, fevers, flu, lung disorders, nosebleeds, and perspiration. It also helps regulate and improve the function of the liver, while also protecting the liver from toxic chemical damage and to treat hepatitis. Yarrow is often overlooked but can be helpful for our furry friends with acute cystitis, arthritis, fungal infections such as candida and bacterial infections that affect the stomach and bowels. The primary nutrients in yarrow are copper, iodine, iron, manganese, potassium, and vitamins A, C, E, F, and K.